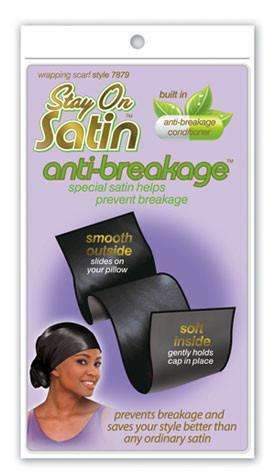 Stay on Satin Anti-Breakage takes the miraculous Stay On Satin fabric and treats it with a special anti-breakage conditioner. This dry to the touch yet effective conditioner, conditions and strengthens your hair as you sleep. Stays on all night so you wake up right! Prevents breakage and saves your style better then ordinary satin.